Ron Smithfield and Gerald Gilman have for the last decade worked to honor the legacy of Montgomery County veterans who have defended this community in times of trouble from the American Revolution through the War of 1812, the Civil War, two World Wars, Vietnam, and the Gulf Wars. Their efforts, along with the work of other dedicated individuals, have produced four books, titled Faces of Valor, detailing the service of more than 1,250 local veterans. The purpose of these four volumes is to honor local veterans and active military and to highlight a major influence on the local history of Clarksville, Montgomery County and Fort Campbell. This project is sponsored by the Kiwanis Club of Clarksville, where Ron Smithfield has been a member since 1967, with 46 years of perfect attendance. Founded in 1920, the club is one of the earliest in Tennessee. Veterans have had a huge influence on the club with 33 of its 97 presidents having served in the armed forces. Smithfield served as president in 1976-77. In addition to producing Faces of Valor, the Kiwanis Club has sponsored a program in which more than 14,000 children have interviewed veterans or current military and written essays with $20,000 in awards for students and schools. Smithfield has recently retired from serving as president or vice president of Smithfield Manufacturing, Inc., for 46 years. In addition to his heritage work in preserving a slice of Montgomery County’s history through Faces of Valor,” Gerald Gilman has contributed much to Clarksville’s arts culture. He is a member of the Directors Guild of America and has worked with the Mid-Cumberland Arts League, Clarksville Community Concert Association and the Downtown Artists Cooperative. 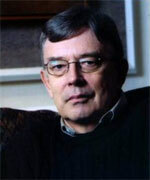 Richard Gildrie was intrigued by 17th century New England when he joined the history faculty of APSU in 1970. However, he soon realized Clarksville and Montgomery County had intriguing histories of their own. While he continued to delve into colonial New England history, Gildrie also began to discover fascinating events and people from Clarksville’s past. He has authored two books on this community’s history: “Heirs Through Hope: A History of Trinity Episcopal Church, Clarksville, TN,” in 1983 and “A History of Austin Peay State University, 1927-2002, and Its Predecessors, 1806-1926,” with Howard Winn in 2002. 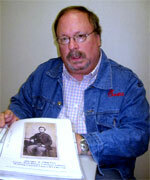 Gildrie has written scholarly articles on the Clarksville Fire of 1878 and guerrilla warfare in the lower Cumberland River Valley from 1862 to 1865 and contributed chapters to “Historic Clarksville, 1784 to 2004,” “The First Fifty Years of Austin Peay State University, and “Land Between the Lakes.” He continues to research Tennessee’s heritage and has an article on “The American Revolution in the Tennessee Valley,” in the forthcoming book, “Before Tennessee,” edited by APSU colleague Kris Ray. Gildrie has received all three major faculty awards at Austin Peay: Distinguished Professor for Teaching in 1980, Richard M. Hawkins Award for research in 1984, and the Chamber of Commerce Distinguished Professor for Community Service in 1998. He earned his Ph.D. in history from the University of Virginia in 1971 and has received several awards from the National Endowment for the Humanities. Jeff Bibb and Frank Lott have collaborated on a half-dozen interpretive exhibits for the Customs House Museum, the Montgomery County Courthouse, RiverCenter and Fort Defiance. 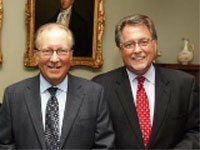 The most recent of these, “Becoming Clarksville: Honoring Legacies of Leadership,” opened Nov. 12 at the Customs House. Lott conceived the exhibit project and was the lead player in working with the Clarksville Jaycees Foundation to procure exhibit underwriting. Both partners served in leadership positions during the monumental effort to resurrect the decimated downtown district as it recovered from the 1999 tornado. Bibb served as co-chair of the City’s Tornado Task Force while Lott served on the Physical Planning Committee and was also a leader in the reconstruction of historic Trinity Episcopal Church. Together they formed the Historic Clarksville Publishing Company Inc. in 1983 to publish the commemorative history book for Clarksville’s Bicentennial Celebration, Historic Clarksville: The Bicentennial Story. The book won several awards, including the ICON Award from the Tennessee Association of Museums and was updated in 2003. A lifelong interest in history has been a motivating force for Lott both personally and professionally. Lott has been closely involved with the Customs House Museum and Cultural Center since its inception in 1983, serving three terms as museum board chairman. His commitment to the Customs House has helped it achieve a notable level of success as Tennessee’s second largest general museum. Lott has combined his interest and expertise in art and history, serving on the Public Arts Committee for the statue honoring photographer Nora Witzel by the Montgomery County Courthouse and for the restoration and relocation of Clarksville’s Doughboy statue on Legion Street. He chairs the county-city Civil War Sesquicentennial Commission, coordinated content development and installation of six Tennessee Civil War Trail markers located at sites throughout Montgomery County, and organized and served as creative director for Clarksville and Montgomery County’s Civil War Journey, a 40-page guide book and driving tour for visitors published by the Montgomery County Convention & Visitors Bureau. 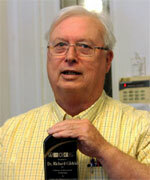 Jeff Bibb served as founding chairman of the Clarksville River District Commission. Under his leadership, the RDC earned recognitions for its planning efforts, project initiatives and for fostering public access to the water, which transformed a neglected riverfront into a shining icon of community pride. In promoting the riverfront’s significance to the community’s quality of life, he helped raise $25,000 to twice host the American Waterways Wind Orchestra’s floating three day arts residency program and free symphony performance on the banks of the Cumberland River. Karel Lea and Greg Biggs have been major participants in almost all of the American Civil War projects initiated in Montgomery County during the last decade. They founded the Clarksville Civil War Roundtable, and Greg chairs the Inventory and Asset Development subcommittee of the Clarksville/Montgomery County Civil War Sesquicentennial Commission. He has served as president of the Montgomery County Civil War Preservation Society and the Friends of the Fort Donelson Campaign. He was also the lead historian for the Fort Defiance Interpretive Center. The Biggs’ influence in our understanding of the Civil War extends across the United States. Greg, sometimes co-authoring with Karel Lea, has written more than a dozen articles published in Blue and Gray Magazine (for which he has served as an associate editor), Civil War Regiments, Civil War News, and North South Traders Civil War. They are sought-after speakers and have given more than 100 talks on 30 different topics to organizations in nearly half of the states in the U.S. In addition, Greg has conducted numerous tours, dealing mostly with the Western Theatre of the War, tracing the Fort Donelson Campaign, the Atlanta Campaign, and the Tullahoma Campaign. One of Greg’s specialties is flags used by both sides. He has served as a flag consultant for museums in Tennessee, Georgia, Ohio, Alabama, North Carolina, and Texas. He is the text editor for the Flags of the Confederacy website, writes a regular column on flags for Civil War News, and is currently writing a book, Volunteer Banners: Tennessee’s Civil War Flags, for the Tennessee State Museum/University of Tennessee Press. Karel Lea specializes in the effect of the war on civilians and has given a number of programs on the lives of women during the war. As we approach the third year of the Civil War’s 150th anniversary, both Karel Lea and Greg Biggs are serving the county as knowledgeable resources about its heritage during this tumultuous period of our history. Having served as Montgomery County Historian since 1993, Eleanor Williams has been active in increasing knowledge about our local history through authoring books, serving on historical boards and commissions, and presenting programs and dramatizations about Montgomery County’s heritage. She is the author of four books on local history: Nineteenth Century Heritage (co-authored with Ursula Beach), Homes and Happenings, Cabins to Castles and Worship along the Warioto. Other publications include A Child’s History of Montgomery County and Henrietta Heritage as well as work in the latest publication of Historic Clarksville: 1784-2004. Eleanor currently serves on the Customs House Museum Board, Montgomery County Historical Society Board, Public Records Commission, Clarksville-Montgomery County Civil War Sesquicentennial Commission, Historic Preservation Committee, Service and Sacrifice Committee which honors local veterans, and Nannie Haskins Diary Committee. In addition she has served on Friends of the Library Board, Montgomery County’s Tennessee Bicentennial Commission (which worked to restore the L&N train station) Montgomery County Millennium Commission, committee for the restoration of the WWI Doughboy on Legion Street, and as president and publication editor for the Montgomery County Historical Society. Eleanor is a member of 13 patriotic and genealogical societies and a active member of First Baptist Church of Clarksville, having been married there 54 years ago this December. She has gathered historic photos for various county offices, composed information for driving and walking tours of Clarksville, written numerous articles, spoken to innumerable community groups, and provided information to countless individual citizens. She is married to James Williams and they have two daughters, Gayle Moore and Donna Page; three grandsons and five great-grandchildren. They further pointed out, “Randy’s passion for the Civil War, and Clarksville’s role in this pivotal time of our nation’s history, is unparalleled. Randy is a walking, talking, encyclopedia of Clarksville lore and goes out of his way to share his knowledge with others. Randy is eager to help any who ask — tourists, genealogists, Civil War researchers, and even the local tourism agencies — in his personal quest to see that our heritage is not forgotten. In addition Randy has honored local veterans through his work on Faces of Valor and More Faces of Valor. 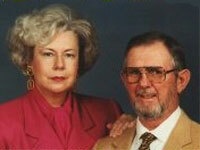 In 1974, JoAnn and Glenn Weakley began work on their dream of rebuilding the settlement of Collinsville. They opened Historic Collinsville to the public in 1997. This living history museum features authentically restored log houses and outbuildings dating from 1830 to 1870. The settlement takes visitors from the earliest “first home” to the expansive big house on the hill with separate kitchen, living and sleeping areas. Each home and outbuilding has been painstakingly restored to its original condition and furnished authentically. The Weakleys maintain these building and have recruited a group of dedicated volunteers to keep Historic Collinsville open to the public for most of the year. They have also expanded the living history museum to include the Irby-Bumpus Wildlife and Native American Center. The Weakleys also maintain an active role in the community. JoAnn Weakley was a member of the founding Board of Trustees for the Clarksville Museum and later served as Chair of the Board. Glenn has successfully operated both the 100+ year-old family farm as well as additional acreage he has acquired since moving from Overton County to Montgomery County in 1952. Secretary of State Riley C. Darnell has been a central catalyst in preserving the heritage of Clarksville and Montgomery County. 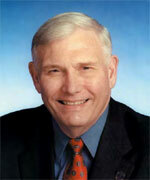 In his distinguished career, Secretary of State Darnell graduated from APSU (1962) with a degree in History. He holds a JD Degree from Vanderbilt University’s School of Law in 1965, and served in the U.S. Air Force as a Captain and Judge Advocate General between 1966-1969. After military service, Riley returned to Clarksville to practice law. In 1970, Darnell was elected to the Tennessee House of Representatives from the 67th District and served there for five two year terms. While in that position he worked hard to promote APSU, Clarksville and Montgomery County. Riley was elected to the State Senate in 1980, where he rose to be Majority Leader of that legislative body. During his service in the Senate, he exerted tremendous influence in two heritage projects in Clarksville. The first was the campaign to prevent the demolition of Harned Hall, the most historic site on the APSU campus. As Majority Leader, he lent his considerable support and worked to obtain funds for adaptive reuse of the historic building as a high tech classroom and office building. This support was crucial in the preservation of Harned Hall. Between 1980-1984 an effort was launched to establish a Clarksville-Montgomery County Historical Museum. Initiated during the administration of Mayor Ted Crozier, the project was to be supported by money generated by a tourist hotel tax. The tax gave 25 cents of each dollar collected by the City and County to finance the project. Additional financial support was to come from private fund raising and a major donation from the estate of Donald and Finley Gracey. Darnell was a robust supporter of the Museum Project. When it was evident that success of the Museum warranted expansion, Darnell, as majority leader of the State Senate, was instrumental in obtaining funding. A major blot on Clarksville’s political history occurred in 1992. Riley Darnell was defeated for re-election to the State Senate. Fortunately, his former colleagues in the House and Senate selected Darnell to the position of Secretary of State. A move greatly lauded by his many friends and the Darnell family in particular. This post was most suited to Riley’s experience and abilities. It included the office of keeper of the state’s records, registry of corporate charters, and other state commercial records. Darnell is in charge of the State Election Commission and Election Finance. Further, the Secretary of State is the Chairman of the State Library and Archive Management Board. He is currently planning a new and expanded State Library and Archives which will undoubtedly be a major legacy of his service. Secretary Darnell most recently was a major contributor to our communities efforts to obtain a $2.2 million TDOT Grant to finance the establishment of the Fort Defiance Historical Park. Thanks to the work of Secretary of State Riley Darnell and House Majority Leader Kim McMillan, Governor Phil Bredesen awarded the grant to the City of Clarksville. Construction of the Interpretive Center will begin at the end of October 2008. Riley Darnell has been instrumental in preserving the heritage of our community. He has done so quietly, and effectively. Riley has been a great public servant in the best sense of that concept. Dr. Thomas Howard Winn, Austin Peay State University professor emeritus of history, has been actively involved in preserving the heritage of Clarksville and Montgomery County most of his life. For more than 30 years, Winn has served on or headed the following heritage related efforts. Winn worked with the initial group to found the Clarksville-Montgomery County Historical Museum, later renamed Customs House Museum. He served as chairman of the Museum Planning Committee, 1981-82, and as chairman of the Board of Trustees for the Clarksville Montgomery County Historical Museum, 1983-1987. The museum opened in 1984. Winn has served as president of the Montgomery County Historical Society from 1983-1986 and 2001-2002, was a member of the Riverwalk Commission 1987-90, chairman of the Main Street Clarksville Board of Directors (1983), a member of the Regional Historical Zoning Commission (1992-8), for which he also served as chairman from 1994-97. Winn served on the Clarksville Bicentennial Planning Committee from 1983-84, and was vice-chair of the Homecoming 1986 Steering Committee. He was co-chairman of the “Save Harned Hall Committee” that saved APSU’s oldest building from demolition. It resulted in the adapted reuse as a high-tech classroom and office building, while saving the building’s original facade. 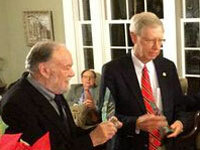 Professor Winn was awarded the Chamber of Commerce Distinguished Faculty Award for Public Service in 1993. He is principal author and editor of the exhibits at the Cumberland River Center. Titled “As the River Flows: A History of the Cumberland River,” this exhibit opened in 1999. Winn was appointed to head the Fort Defiance Park Project Commission, which secured a $2.2 million grant to establish a historical park in North Clarksville. Winn has published numerous articles on the history of our area appearing in the Tennessee Encyclopedia of History and Culture, Southern Quarterly, Tennessee Historical Quarterly, Encyclopedia of the War of 1812, Tennessee Conservationist, and American National Biography. Winn has co-authored A History of Austin Peay State University, 1806-2001, researched and wrote chapters in Historic Clarksville: The Bicentennial Story, and coauthored Clarksville Tennessee in the Civil War: A Chronology.